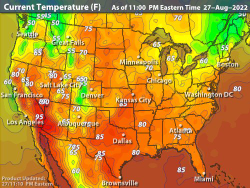 Current temperatures color contoured every 5 degrees F.
Lines of equal temperature in degrees Celsius. 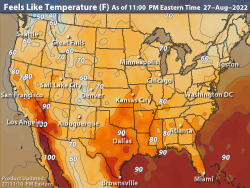 The Feels Like Temperatures map show what the outdoor temperature will feel like for the current day. Feels Like Index is a factored mixture of the Wind Chill Factor and the Heat Index. 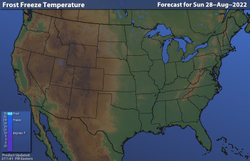 The Frost and Freeze map shows where frost cant be expected and where temperature are forecast to fall below 32 degrees F.
WSI's Worldwide Continental Map depicting color contour isotherms, or lines of equal temperature in degrees Celsius. 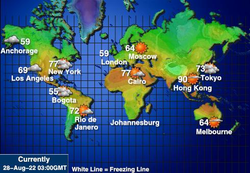 Major metropolitan cities also depicted along with prevailing weather icon. Data are updated hourly to indicate current conditions in Universal Time Code/UTC.